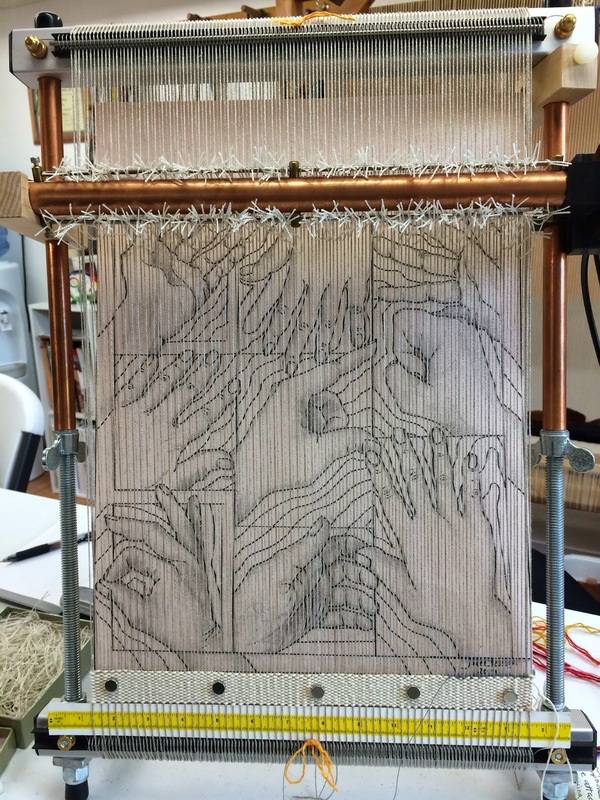 I am seriously getting ready to start weaving my "Hands On" tapestry and it occurred to me that my way of getting started might be something to write about. I spent almost a whole day choosing a palette of colors. Usually I choose many more colors than I will actually use but it is a place to start. This tapestry will have quite a bit of silk and linen as well as my standby, wool. I have larger amounts available of most of the choices in the box but I find that making small butterflies or bobbins like this gives me a nice visual idea of the color,texture and fiber choices in my mind. I don't make an actual painting of the complete design with colors. It is not that I don't think this is an excellent idea and would probably save me some time. I have a fear that if I made a painting first that the tapestry wouldn't actually get woven. So normally I do a drawn design for the cartoon and then I select a palette of colors. I try to visualize what I want to accomplish with the tapestry and imagine the colors I have chosen in the places I have in mind. Assuming there will be changes in the design and the color choices is part of the process. This sense of knowing and yet not knowing keeps the weaving process adventurous for me. 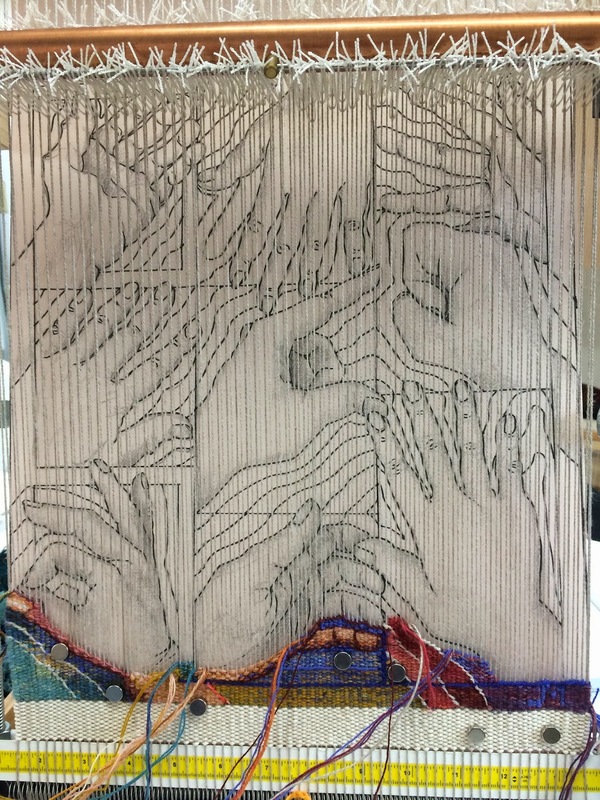 I had really planned to start weaving this on Monday and I have plenty of incentive because this will be my demo piece for the Yellow Rose show in Sequin, Texas and the Rendezvous show in Oklahoma City. There is more information on both of these to the right under SHOWS. 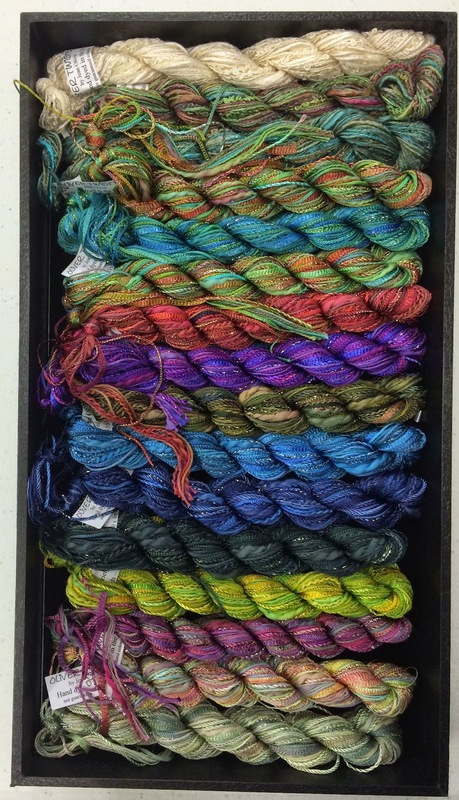 On Tuesday I discovered some fibers in my collection that needed to be in my palette box selection so I delayed starting the weaving to do some last minute spinning. One small skein is finished and I made a ball of it this morning, the other two are drying and should be ready tomorrow. I am getting pretty comfortable with spinning a nice slightly felted singles for tapestry that blends well with my Ymmyarns and adds an extra punch to my yarn collection. 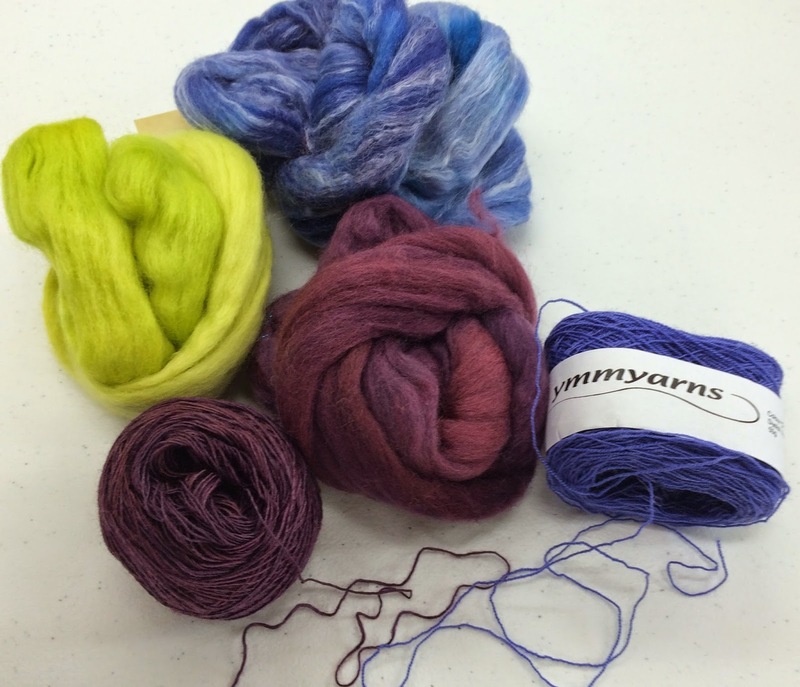 Here is a picture of one of my favorite Ymmyarns colors with some of my handspun singles side by side. I think it was worth the delay and hopefully I will have some weaving progress to report soon. Deadlines, like the shows, can be very useful that way. 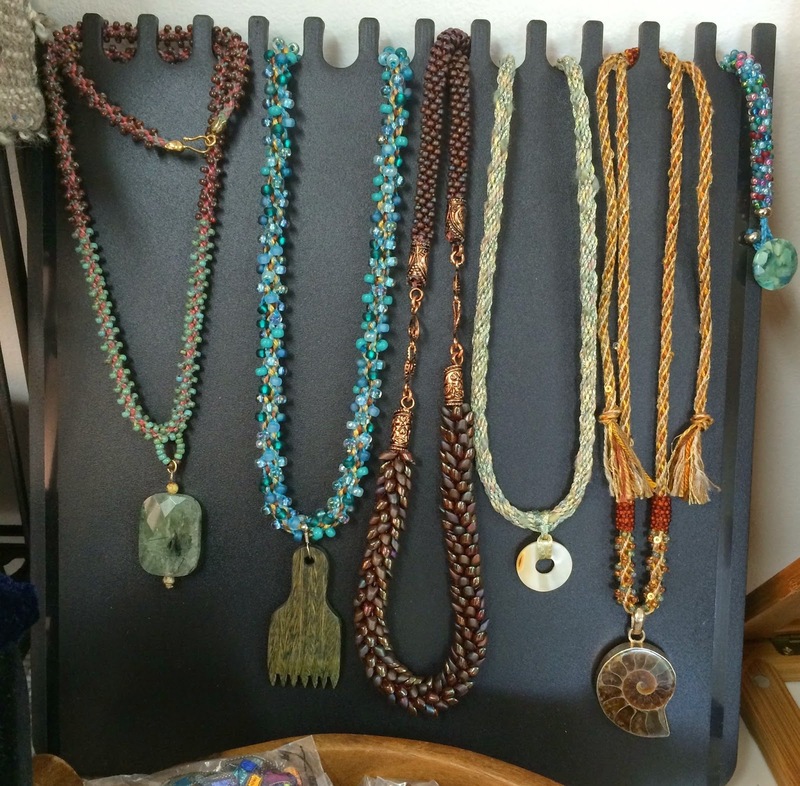 In addition to getting ready to start a new tapestry and continuing to work on the Path Through 2014 Tapestry Diary I have been stocking up on items I usually carry and trying some new ones for the upcoming shows. 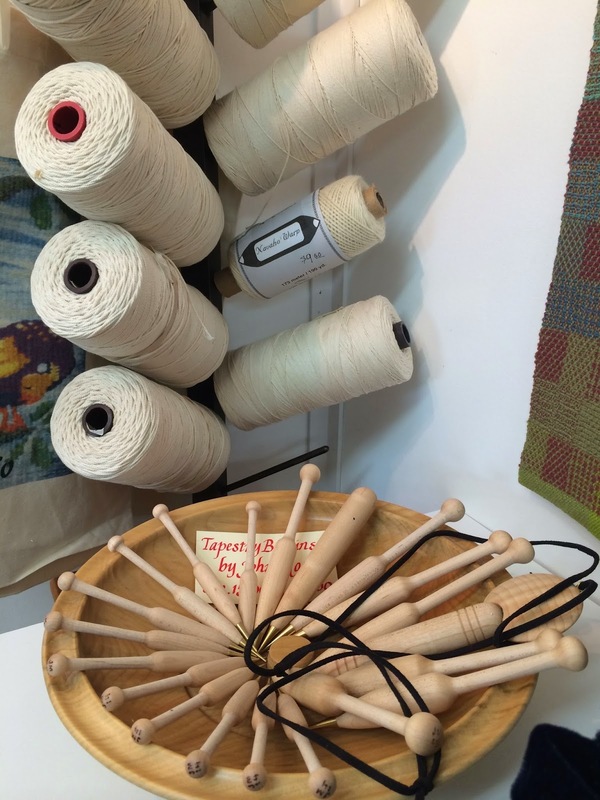 and a great selection of John Moss bobbins and cotton seine warp for tapestry. 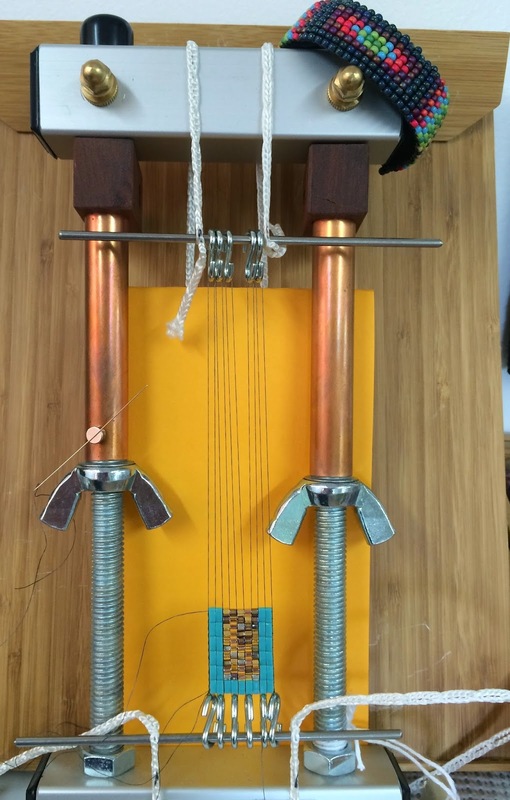 The new Mirrix looms will be arriving soon and there are a good selection of Mirrix accessories in stock. 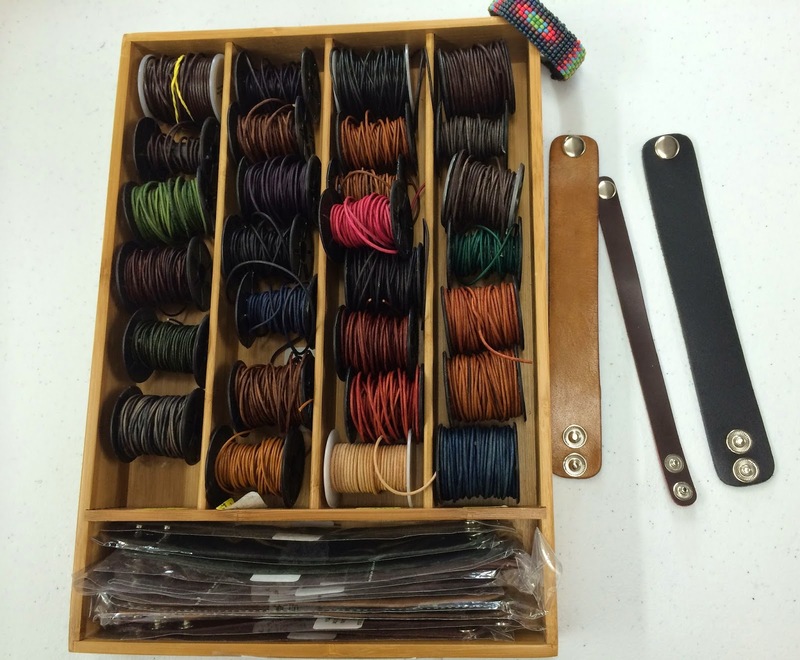 In addition to the leather cord selection I also have some leather cuffs in different sizes and colors. 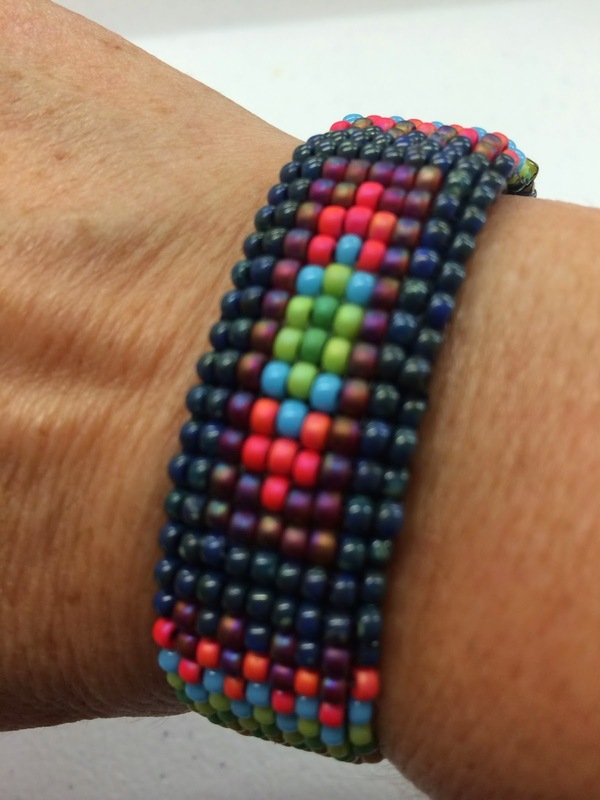 this is a great alternative finish for woven bead and/or fiber jewelry. and a back view showing the leather cuff it is mounted on. This is lined with ultra suede and makes for a very comfortable and easy on/off bracelet style. Of course I have lots of ultra suede colors available in precut strips for bracelets. Once a project comes off the loom a new one goes back on. Here is the Mini set up with the no warp ends kit and a new bracelet project that uses some of the new half tila beads I just got in. I also have new triangle beads, magatamas and baroque beads. I have started a couple more of the leather wrap bracelets to show off more of the new bead collection and I have many new jewelry findings for finishing leather wraps and kumihimo jewelry projects. 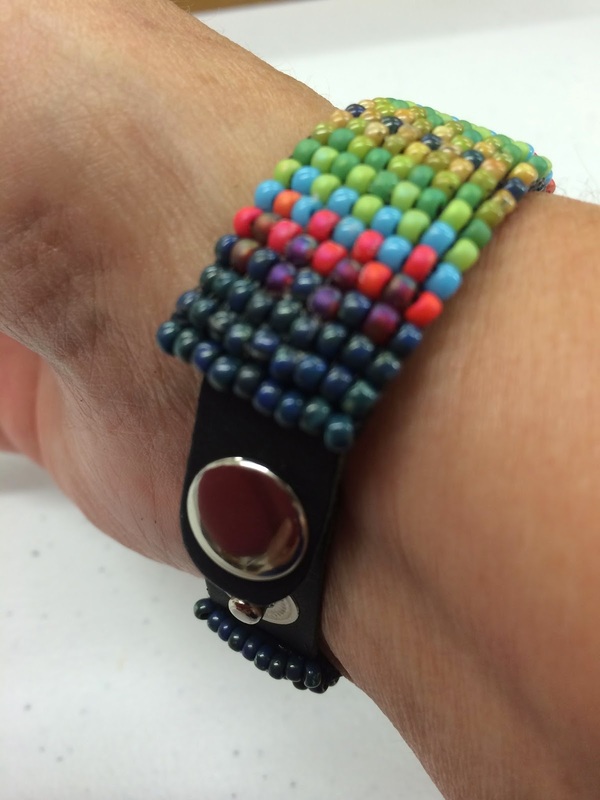 I have a tapestry bead project to demonstrate this great beginning tapestry project that can be made into bracelets with metal cuffs or the new leather cuffs. This also makes great hat bands, belts or purse straps. I think it would be stunning as trim on a knitted Channel style jacket too! 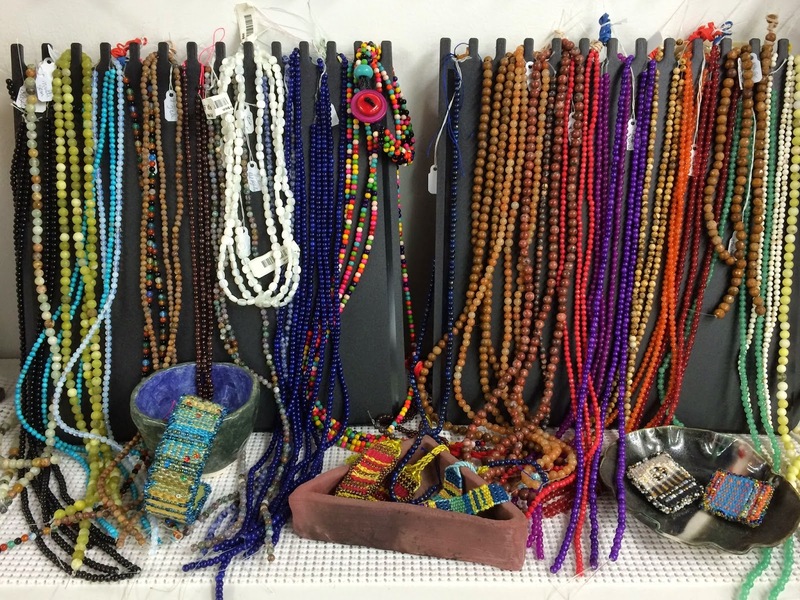 In addition to all the beads I now have a good selection of natural stones as well. 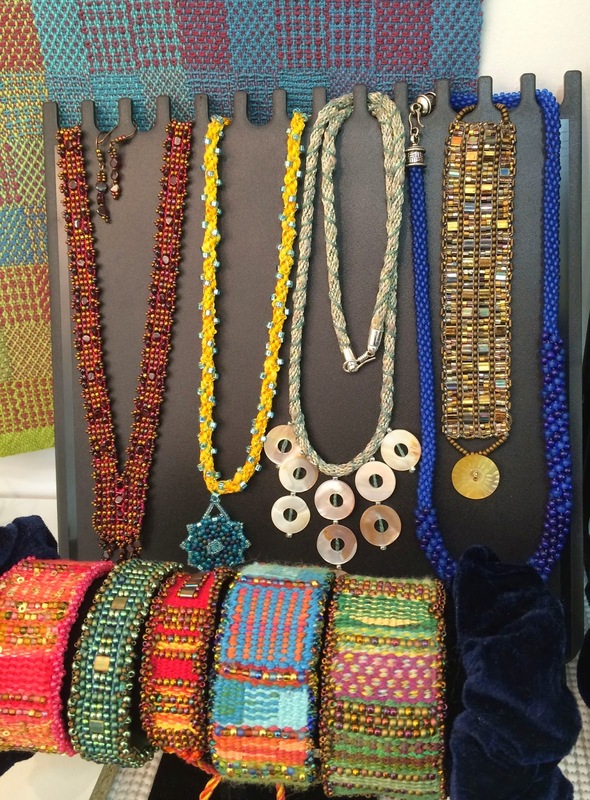 these add an extra touch to leather wraps and kumihimo projects. 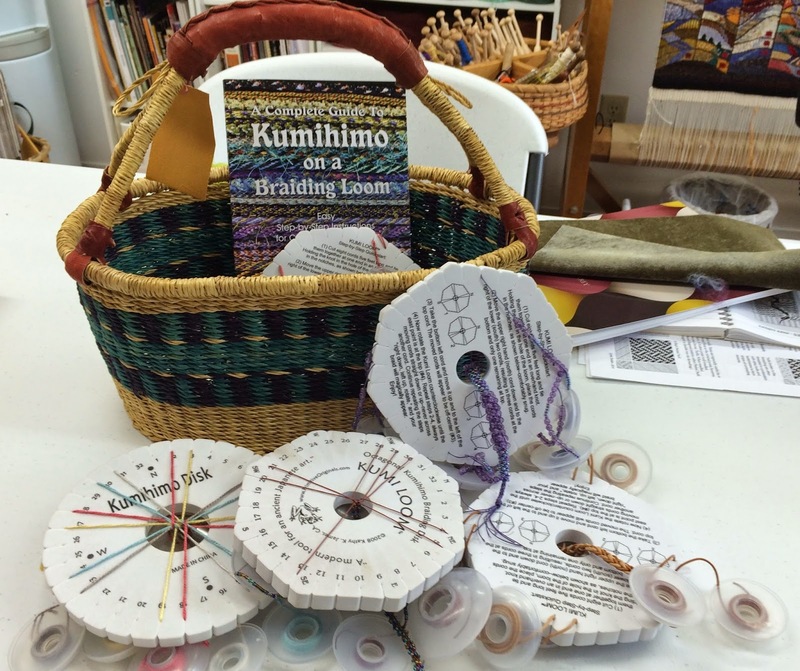 Speaking of Kumihimo, I have all the supplies you could need, including kits, books, instructions, looms, weights, findings to complete jewelry projects and even some nice focal beads! Did I mention threads? In addition to the silk, hand painted silk, and hand dyed pearl cotton I also have these lovely thread combinations of silks and rayon/cotton fibers. 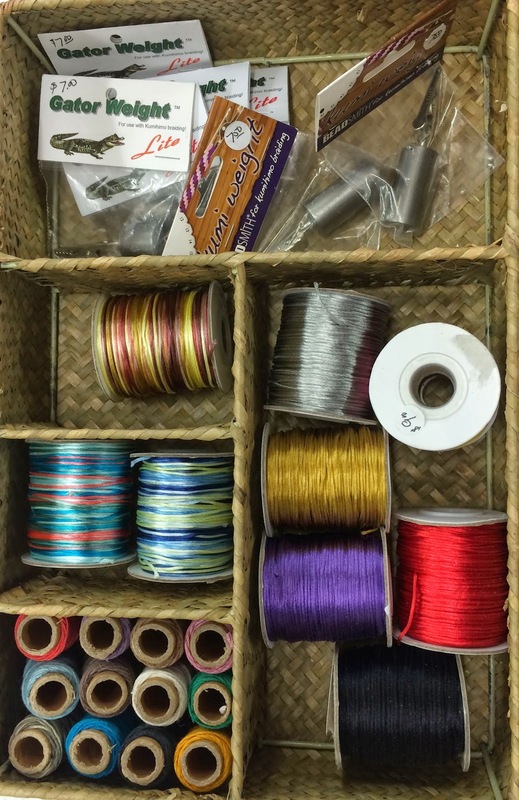 One of the things I love about these kinds of threads is that they can be used for all the things I like to make from tapestries to tapestry bead jewelry to kumihimo. Also new are some silky cotton cords and raffia threads. I have a whole basket full of kumi projects in progress so if you want to see a demo, we can show you flat braids, 8 and 16 strand round braids and braids with beads. 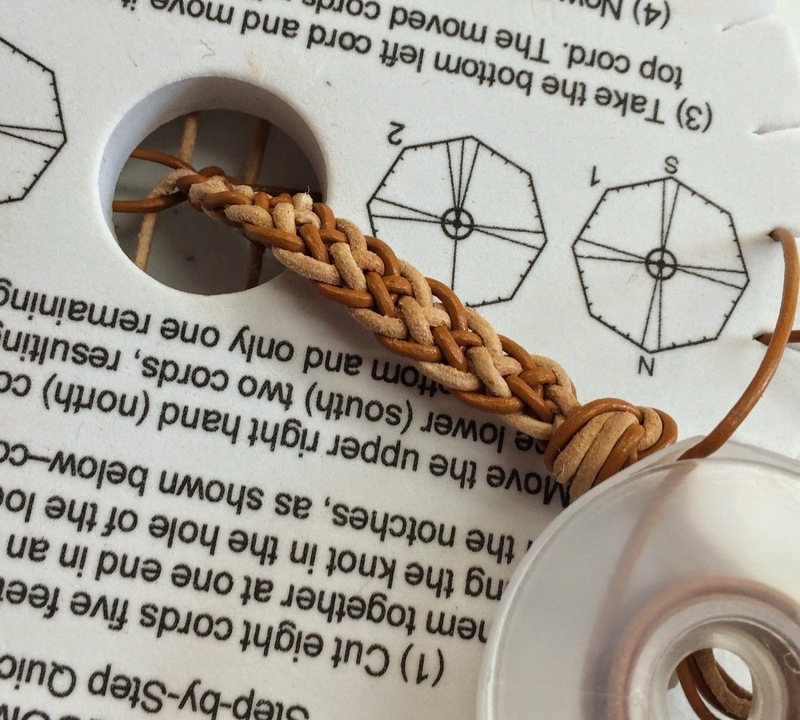 One of the fun new things I tried is kumihimo with the leather cords. i think this would be a great gift for a guy, or a girl, and so easy to learn! 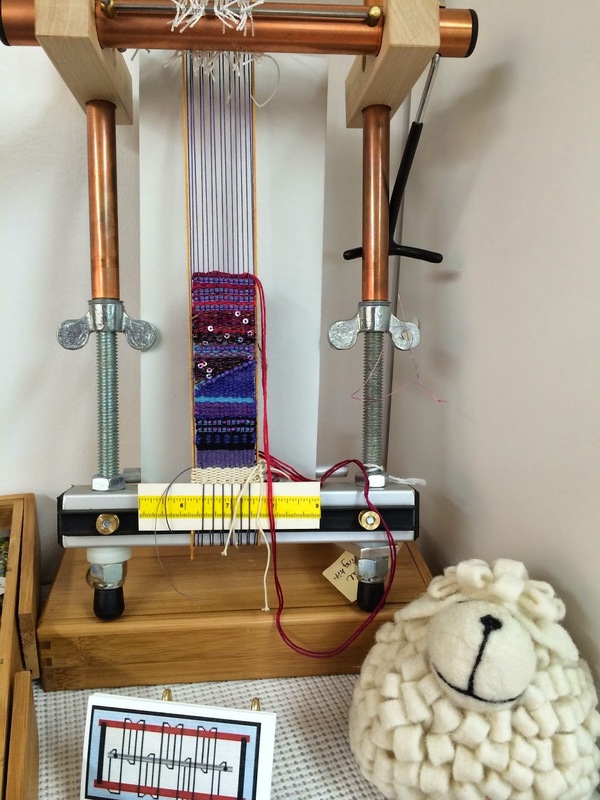 In honor of finishing my Sheep Breed Sampler and because the project has received so many nice comments at last years shows, I am going to give away full sized cartoons with the purchase or paid order of a Mirrix loom at a show this summer. 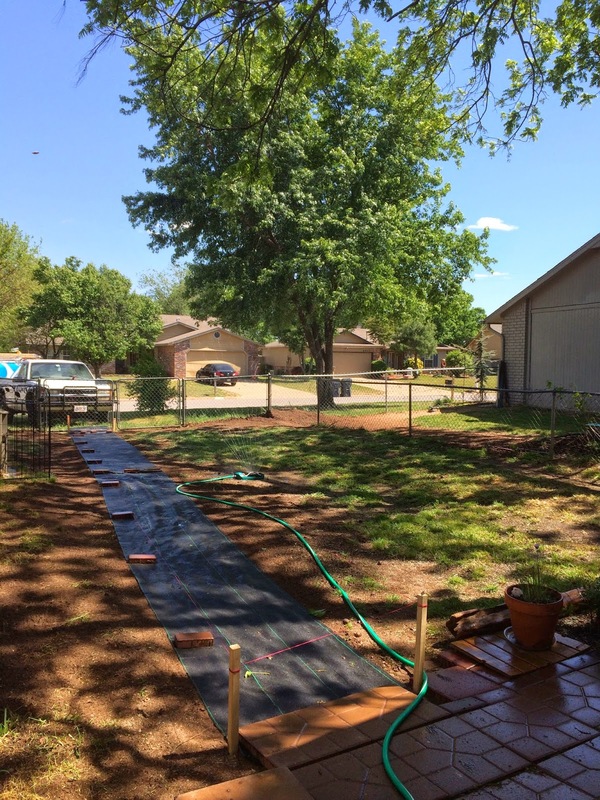 If you have been thinking that this would be a fun project it may be time to start. 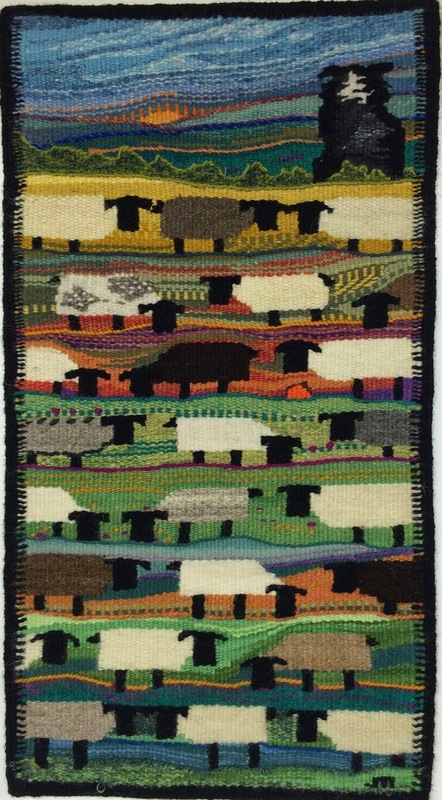 If you send pictures of a sheep sampler being woven on a Mirrix loom I would love to put them on the blog! 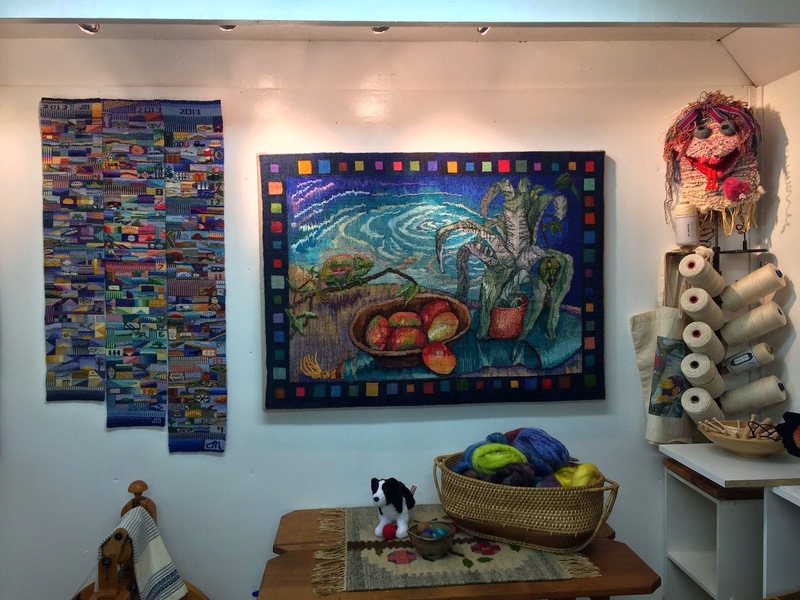 If you are on my Facebook this last bit may not be new news but for the rest, I had the honor of having two tapestries accepted into the Fiberworks 2014 show in Oklahoma City this year. 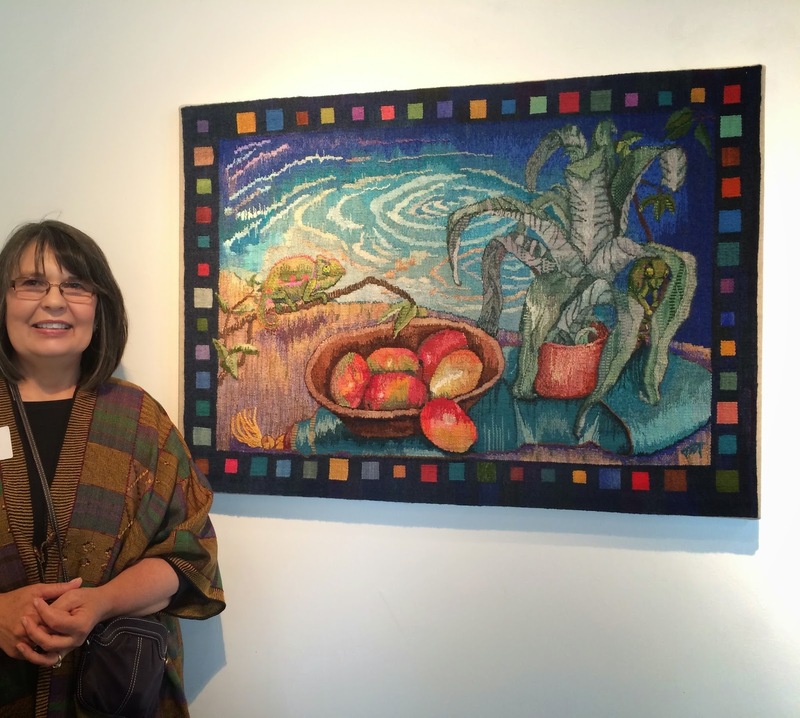 The Mango Hunters and the 2014 Tapestry Diary Triptych were shown along with many other diverse and wonderful pieces. This show is supported and hosted by Fiber Artists of Oklahoma and the juror this year was John Garret. It travels every other show between Oklahoma City and Tulsa. It is no small effort to host and run a show like this and FAO does a superb job with it. I am happy and proud to have an organization in Oklahoma that provides such a wonderful venue for supporting fiber arts in the state and for being involved with the Tulsa Handweavers which donates a great award for weaving at this show. 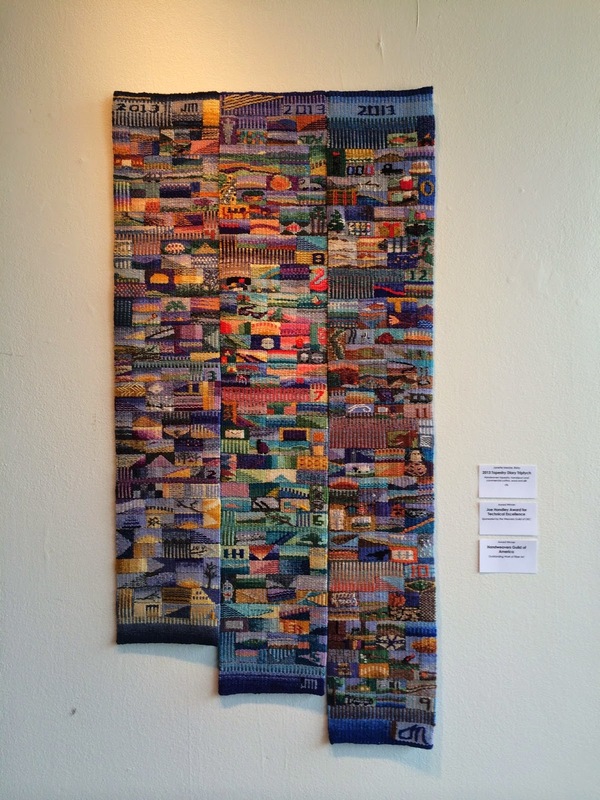 The 2014 Tapestry Diary Triptych won two awards. the Joe Handley award for technical excellence in traditional hand weaving and the Handweavers Guild of America award. 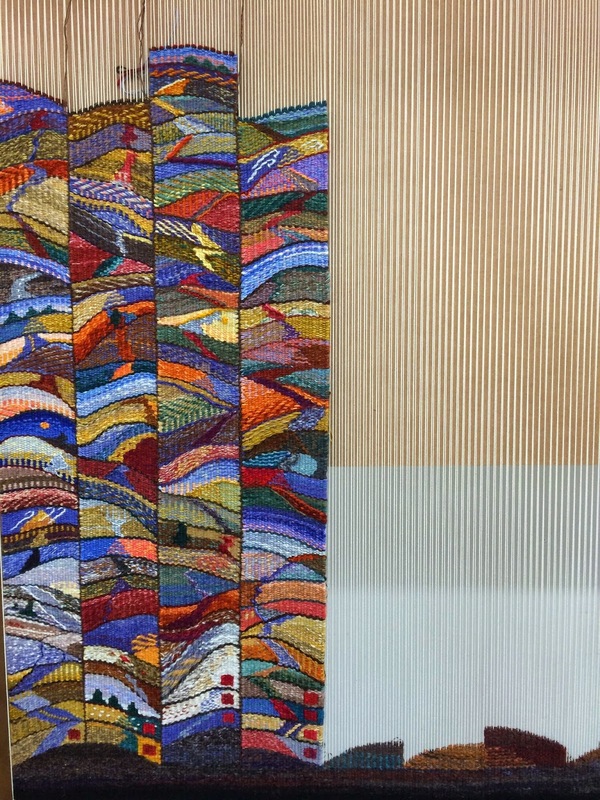 To bring things full circle I have used the check I received to purchase the plane ticket for my trip to Convergence and the American Tapestry Alliance Retreat where I will be taking a workshop with Susan Martin Maffei. It feels great to use the award to further my tapestry weaving skills and experience in this way. 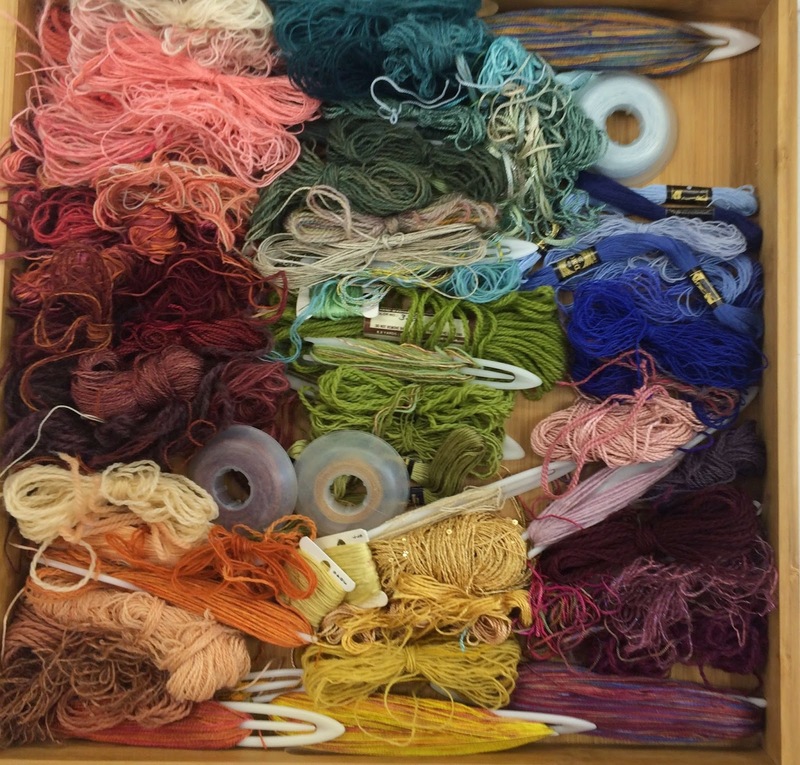 Spring has arrived, Summer is coming and things are getting busy around the Fiber Studio. New supplies are coming in for the shows I will be attending starting the first weekend in June. Finished work has gone out to be exhibited, returned home and may be leaving again soon. Progress is being made on the inside projects, old and new and the outside projects around the studio. 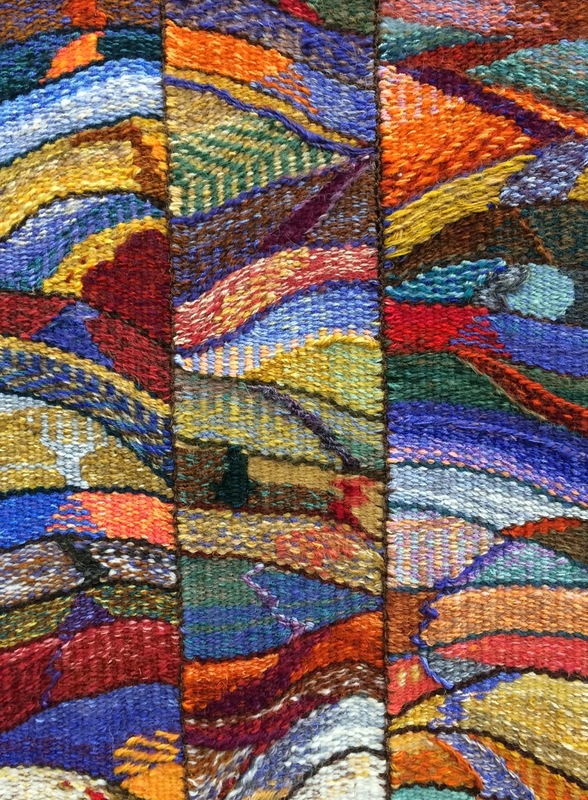 First, a little slice of February, March and April from the 2014 Tapestry Diary. 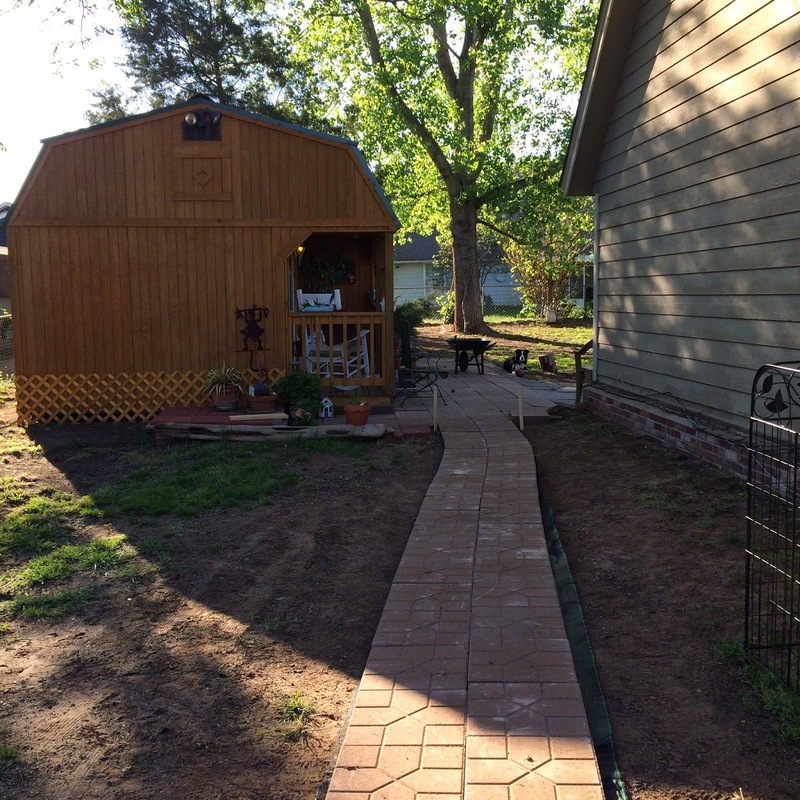 On the outside the path I have been talking about for months now is almost complete. I have a few details to take care of but it is otherwise finished. This makes it easy to get back to the studio even if it has been raining and will also make it easier for me to wheel supplies for shows out to the car. and another coming up to the studio. 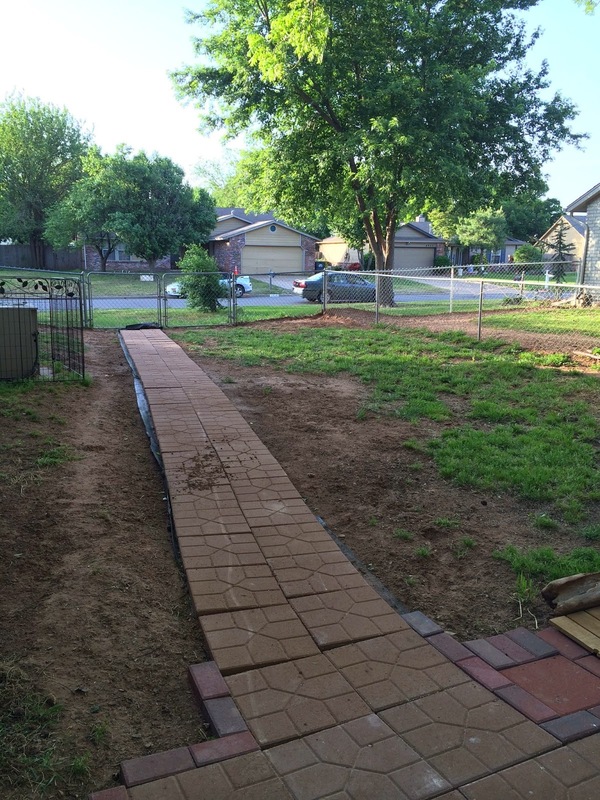 I'm very happy to have this job completed and most of it we were able to do in a weekend. 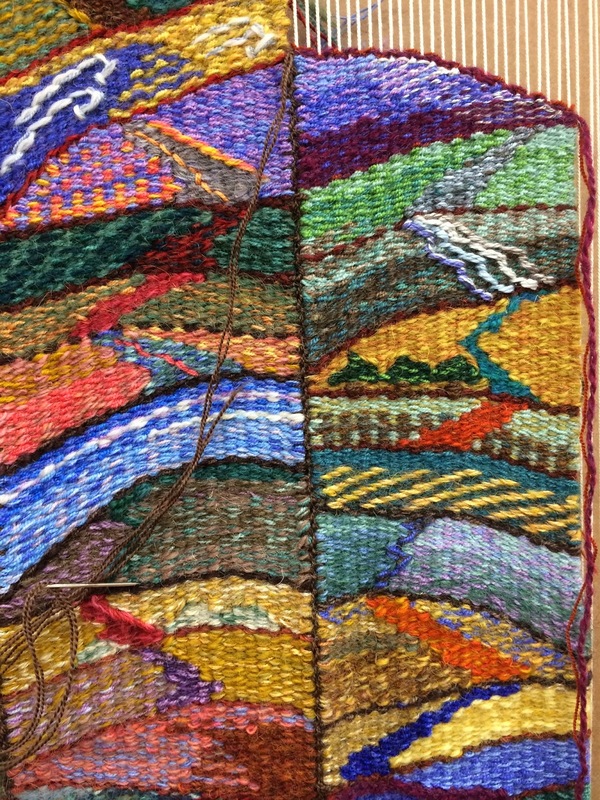 The 2014 tapestry Diary is coming along, day by day. 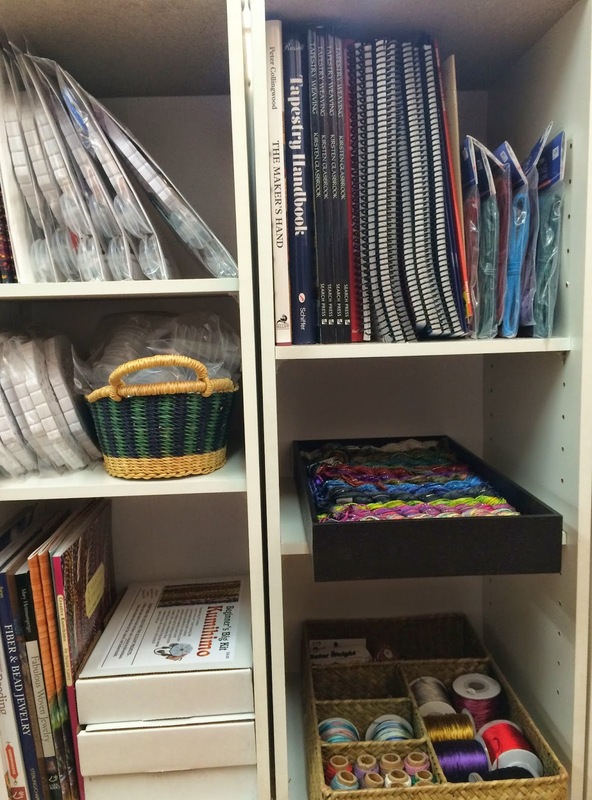 Here is a shot of the first four months of the year completed. I can't believe how quickly this year is passing. I don't have any sneak peeks of May yet but it is coming along nicely. Here is the first eleven days in April. I haven't used many new techniques this month, it seemed like a good time to go back and practice some of the things I have learned before and concentrate on color blending. Here the whole days shown are the 11th through the 22nd. On the 17th I tried a new technique from the Threads Course In Tapestry, #106 on page 41. This involves combining a plain weave ground with rows of open and closed soumak. It is used in the gold area to the left. On the 18th I experimented with the twill and ground weave technique but this time instead on one pick of ground weave between each pick of twill I did an entire pass. I liked the slight difference in the pattern. Finally, here is a close up of the 20th through the end of April. The long and winding road through new tapestry techniques and color blending has been a fascinating journey so far. 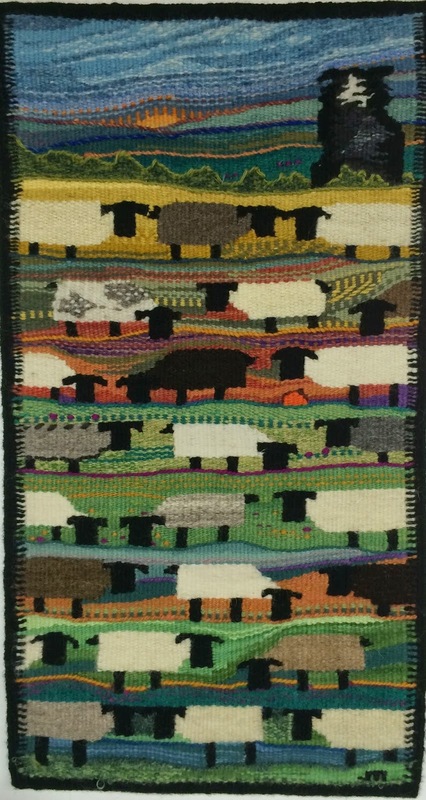 The Sheep Breed Sampler is complete and finished! For those of you that have been reading the blog for awhile I started this to study the different characteristics of wools as used for tapestry yarn. It has been a fun and educational project and I could have gone on and on but it is now complete. My Laddie is watching over the sheep as they graze peacefully! 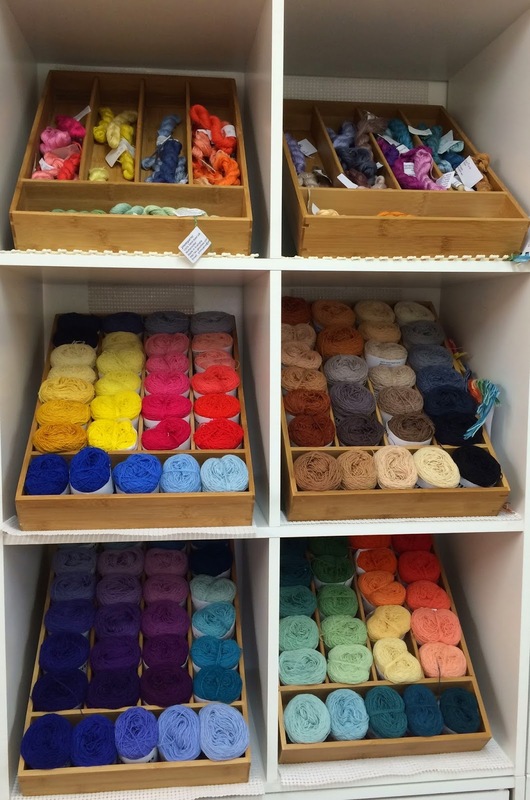 I discovered a few wools I liked that I hadn't tried before and a few I wasn't that excited about. I also did some experimenting with singles versus 2 ply yarns and just had a good time using it for my demonstration sample at the shows I've done for the last year or so. Now I will be able to bring it along this year as a finished tapestry! 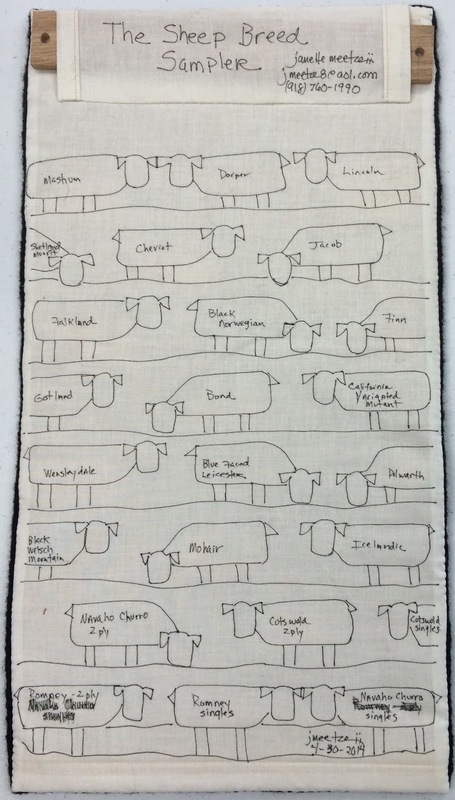 On the back I drew a key to indicate which sheep is which and also indicated where the singles yarns were located. I can highly recommend this kind of project if you are wanting to spin many different kinds of wools and work with them or if you have an actual flock of sheep that you would like to document in this way. 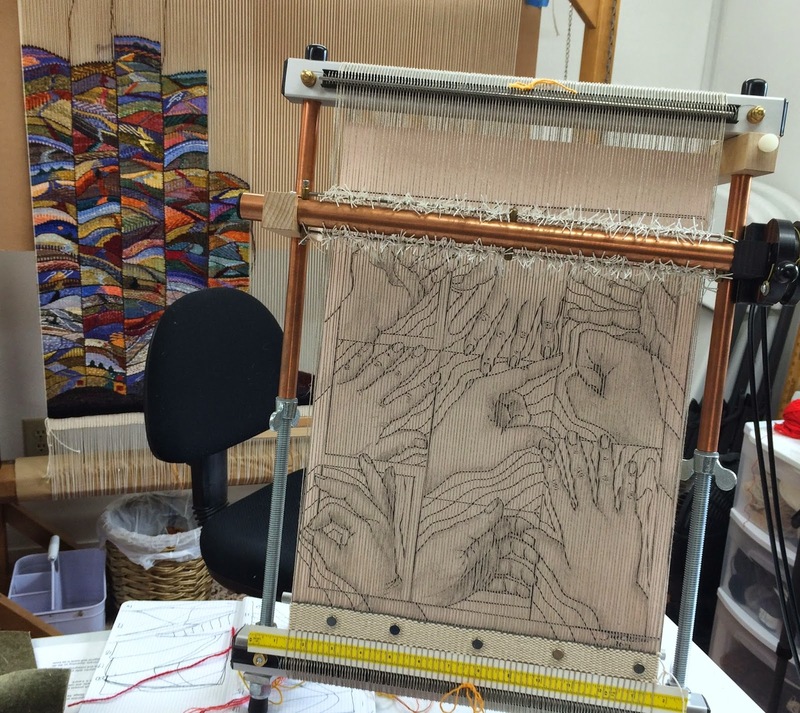 Now that the flock is finished and hanging on the wall I have been able to start a new demonstration tapestry on the 16 inch Mirrix loom. 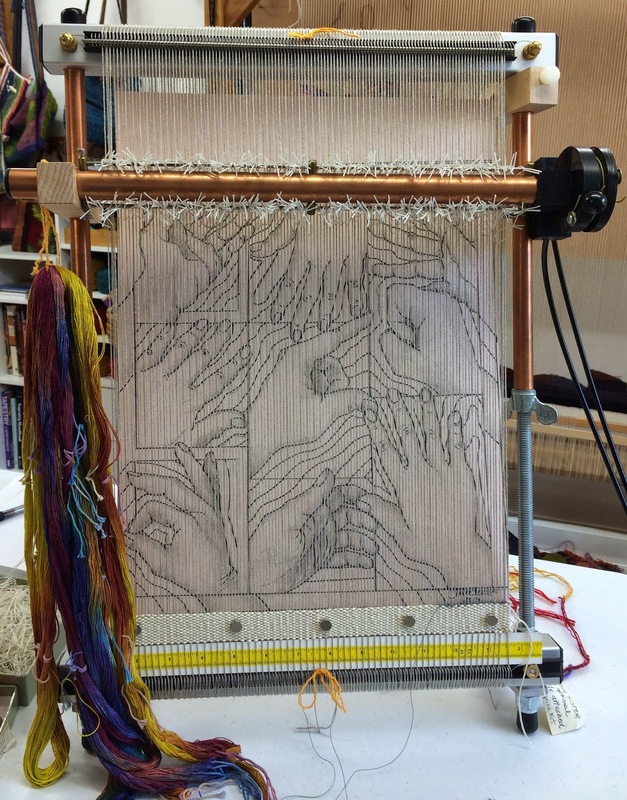 Hands On is the working title and the warp for this one is 8/2 linen set at 10 threads per inch. This will be my second experiment with linen as the warp and I may want to include some linen weft as well. 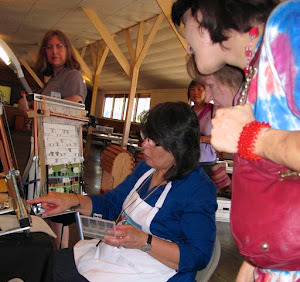 but I think it may include some of the beautiful hand painted silk that I made In Gwen Witherspoon's recent workshop for the Tulsa Handweavers Guild. The Mango Hunters and the 2013 Diary Triptych are back home and hanging in the studio again. Hope to see some of you at the Yellow Rose Fiber Producers Show in Sequin, Texas the first weekend in June. There is more information on the sidebar under Shows. I will also be at Rendezvous on June 14th. Rendezvous is a one day event packed with classes,a spinning circle and venders hosted by the Log Cabin Spinning Guild. This year it will be in a new location at the beautiful Oklahoma History Center, 800 Nazih Zuhdi Dr, Oklahoma City, Ok. It is always a fun event and I will be following up on a later post with some of the new items I will be bringing to the shows.